...Combined with a massive five stage production of absolute state of the art high-end lighting, sound, av, lasers and apparently a UFO and maybe even a dragon!... You can expect a show produced like nothing else before it... We have a circus of over 30 performers & growing.. so far and a line up encompassing the finest talents from the legends to the most contemporary. This is all only possible by a clear demonstration of love for our Christchurch family that have got behind this project. I am deeply humbled. What wonderful people that you are. 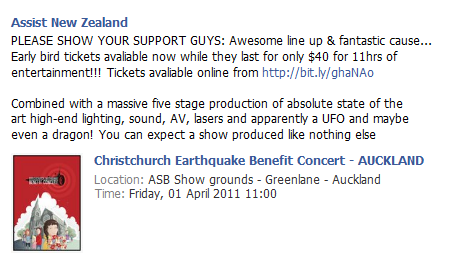 Christchurch, we have your back. PLEASE NOTE: Due to the mind-boggling and deeply saddening events in Japan this past few days there will be 1minutes silence over this entire event. There will also be koha collection points to be donated to the International Red Cross, towards Japan. Japan, you were here for us in Christchurch, we are here for you now. Multiple genre live acoustic and electronic. Art and performance concert for our brothers and sisters down in Christchurch after the tragic 6.3 quake. This event will be produced to the highest level, with top entertainment and total integrity. 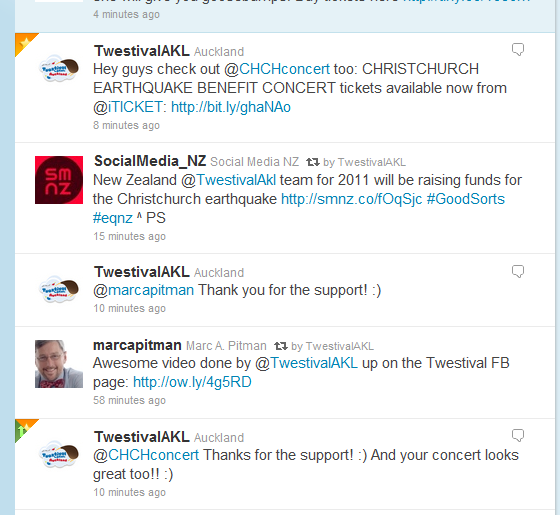 ALL PROCEEDS to go to Christchurch through Metro Law (to ensure transparency) through to selected relief agencies. HUGE boxing tournament following night at ASB Stadium, North Shore (what a weekend!!!) - check out the wonderful work being done here https://www.facebook.com/event.php?eid=199299643428747 - We are working closely with this event also. Thank you http://www.MattBowden.com/ for providing us with the "cornerstone" start up funding for this event. Matt bro, you are one seriously cool man. Thank you ASB Show Grounds who have given their entire venue & services for free to this great cause. You are amazing! Thank you http://firefever.com/ - for our AMZING circus!!! Thank you http://www.andrewstewart.co.nz/ for all their work for resource consent for the event. Thank you http://www.splore.net/ who are donating all of their left over beverage stock from Splore City, for sale & donation. Thank you www.inkcoherent.co.nz who will be running the after party for this event, with all profits going to the cause. Thank you https://www.metrolaw.co.nz/ who will be dealing with the legal aspects of the event, to ensure complete transparency with all financial dealings. Much love & respect to you all.